Every country on the planet, with the exception of Germany, is weird. A total of 192 of them. Like beauty, weirdness is usually in the eye of the beholder. But whatever the beholder might think in this case, the 193rd country, Germany, is definitely super weird, from any perspective. Take my word for it. Why am I so sure it is super weird? I just know. 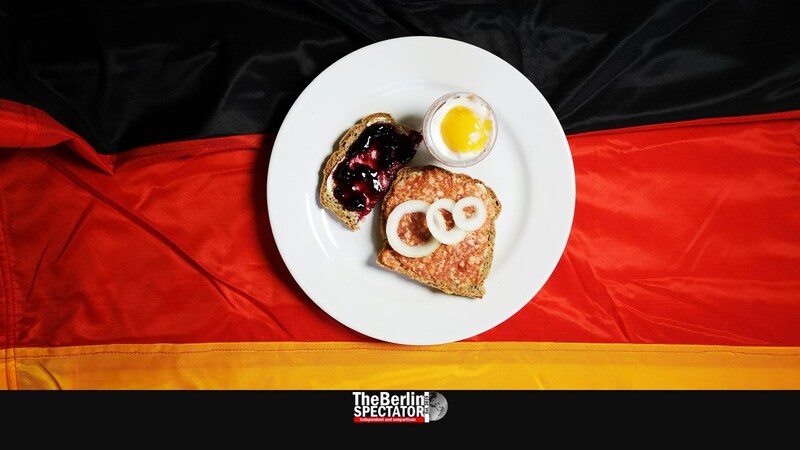 Because the Germans eat ‘Mett‘, raw meat, for breakfast. Because they have hundreds of kinds of bread and put slices of everything on top. Bread with a thick layer of butter and stinky cheese. They just can’t get enough of that stuff. If they don’t get their bread and wurst slices on top, they lose their temper. The Germans are diligent and tens of thousands of them are engineers. But how come they do not have their own version of Google or Facebook? They supposedly build the best cars on Earth, but they let the Americans revolutionize the electric car. They talk about fast internet connections for years, but do not actually speed them up. Even to Germans, Germany can be strange. You return here after eight years, and suddenly the language has changed. Sentences containing reflexive verbs are now being constructed in a super weird way. What on Earth happened here? Weird! You are in Baltimore, Bangkok, Barcelona, Belgrade, Birmingham, Brisbane, Budapest or Burbank. It is Sunday and you want a cook a meal, but the fridge is empty. What do you do? You go to a place called a supermarket. You buy a few tomatoes, pasta, grated cheese and a ready-made spaghetti sauce in a glass. Then you spend an hour cooking it all and seven minutes eating it. Nice. In that situation, what do you do in Berlin? Well, you either call the pizza service or you go to a restaurant. No shopping on Sundays. Period. Oh yes, the Germans worry about the economy all the time, but they just don’t shop every seventh day, because the Lutheran and Catholic Churches say they shouldn’t. Super weird! Let’s get to the most important item on Earth, the Quarter Pounder. It doesn’t exist in Germany. So you do know ‘Pulp Fiction’ by heart? Yes, because of the metric system, the Quarter Pounder is the ‘Hamburger Royal TS’. It tastes good anyway. If anyone believes in climate change and the necessity to reverse it, or at least to slow it down, it is the Germans. They constantly worry about their forests, the air they breathe and what not. But still they will not impose a speed limit on their damned Autobahn. Yes, Germans kick it big-time. They will accelerate their Golfs, Smarts, Fiestas and other tiny shoe boxes they call cars to 200 km/h (124 mph), because they are allowed to. How super weird is that? Soccer! Hell, every single German male seems to love that sport in which 22 guys kick each other’s shank bones. And everyone in the stadium, except for those 22 figures, is drunk. They beat each other, they pee all over the city and destroy buses and trams. Anyone else showing that kind of behavior in Germany would get arrested, but not soccer fans. Weird indeed. Germans tend to dislike Google. Especially StreetView is a bête noire to them. So thousands had their houses or buildings pixelized since they just can’t take the idea of people seeing them on Google Maps or StreetView. Understandably, Google is annoyed with the German’s exaggerated approach to data protection in this regard. That is why they basically gave up on StreetView in Germany. The footage of big cities has not been updated in a long time for that reason. Outside the main cities, there is no StreetView. The Germans just do not want the kind of convenience StreetView offers. Super weird! The Germans feel they are avant-garde when they use English words, but they give them new meanings. ‘Handy’ stands for cell phone, ‘public viewing’ stands for an outdoor soccer championship watching event, and the expression ‘s**t storm’ is being used in the main TV news broadcasts, and by the Chancellor herself. Merkel does not swear in German though, at least not publicly. Mixing soda and apple juice seems to be required by law. They all do it. They also mix beer with Sprite. They eat ‘Quark‘ but do not know what in the hell it is. And they believe both American and English food is terrible. Do they have a point here? Let’s discuss this one next century. In Germany, the ‘office of order’ (‘Ordnungsamt‘) distributes parking tickets. First-graders receive a cardboard cone with sweets inside on their first day of school. German toilets have a platform on which certain items will be on display until they are being flushed down. That’s even beyond weird. Also they have super weird words hardly anyone who is trying to learn the language will be able to pronounce. The grammar is pretty bad. Especially the articles are just impossible to remember. ‘Der‘, ‘die‘ or ‘das’? To hell with that. Roger Boyes knew what he was writing about before he released his book ‘A Year in the Scheisse’ in 2008. It is about his adventures in Germany, his attempts to understand German women, his inner need to develop enthusiasm for curry wurst, and his desperate tries to deal with nudist beach visits. Yes, the Germans are super weird. I am super weird. That’s because I’m German.